The 100mm focal length class is a popular one when it comes to macro lenses. The Tokina AT-X 100 f2.8 macro lens reviewed here adds another choice to the variety of macro lenses with focal lengths between 90mm and 105mm that are on offer in the South African marketplace. This particular Tokina lens is one of their professional grade lenses, signified by the letters AT-X Pro. With a maximum aperture of f2.8, high-quality optics and robust construction, I felt that the Tokina lived up to its professional designation. At the time of writing, this Tokina is also a newer design than the similarly named macro model which is featured on several internet lens review sites. Most of those reviews are carried out with the older model which can be identified by the manual aperture ring around the lens base. This lens does not come with any kind of storage bag, but it does come with both front and rear end caps, as well as the lens hood, as standard. 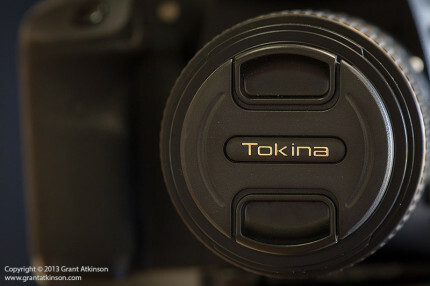 Although Tokina are more typically known for their wide-angle lenses, they have been making macro lenses for some time. This macro lens model is one that was developed in collaboration with Pentax and the two companies shared in the basic design. 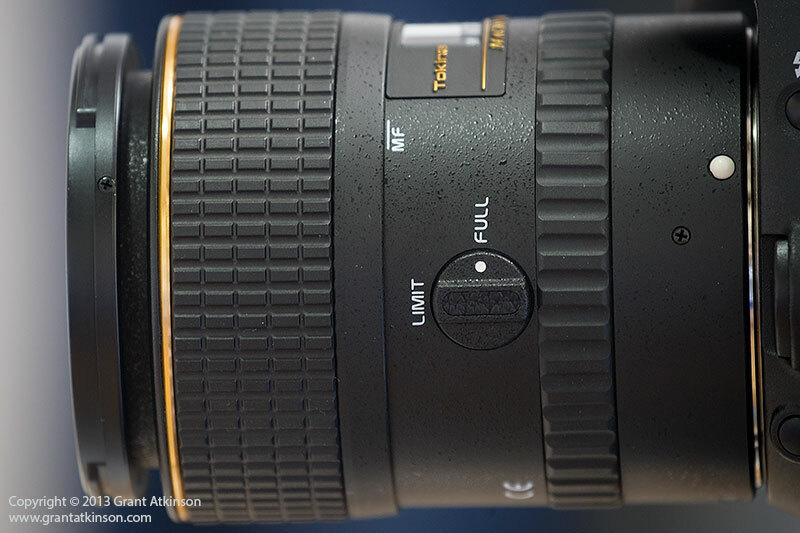 Tokina are known for their build quality, and this macro lens doesn’t disappoint in that regard. The lens mount is made of metal and the Canon mount that I tested fitted firm and snug on all 4 of the EOS cameras that I used it on. 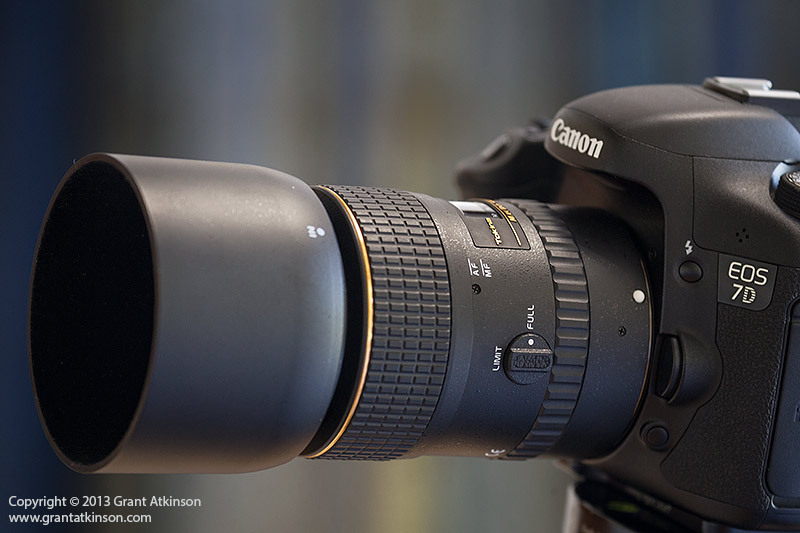 This lens will work on all Canon dslr bodies. 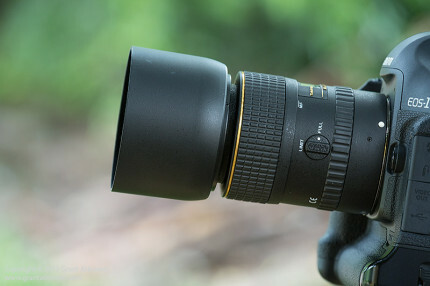 Tokina also make this lens in Nikon mount, but if you are using one of the entry level or older Nikon bodies, be sure to find out if autofocus will be supported with your model of camera first. The lens barrel is made of a combination of metal and a very tough plastic. The exterior coating is very resistant to scratches and minor bumps and dings. The distance limit switch and mounting ring on the lens barrel. A small white plastic bubble on the lens casing shows the alignment point that needs to be matched up with the red dot on a Canon camera body. 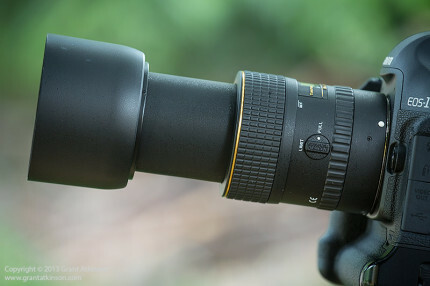 There is a useful grooved rubber ring that goes around the lens and is fixed in place, that makes gripping the lens easy when you are putting it on or taking it off of a camera body. A rotary distance limiting switch that helps to make the autofocus less likely to hunt if you set it to suit the distance you will be shooting at. A focus distance scale is positioned on the top of the lens barrel. There is no conventional switch for changing between autofocus and manual focus. 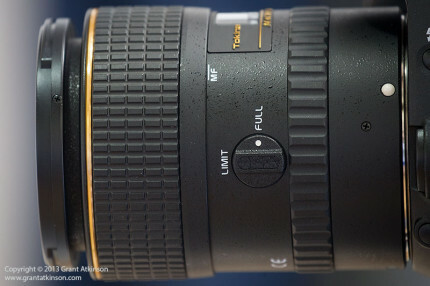 Instead the lens is fitted with Tokina’s One-Touch clutch mechanism. 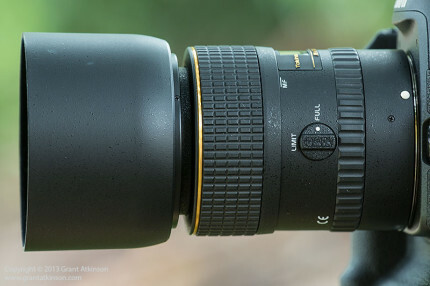 The wide, deeply textured focus ring that is located at the front end of the lens serves not only for adjusting focus, but also to switch between autofocus and manual focus, merely by sliding it forward or backward. Side view of the lens with hood attached. There is a pinch-type lens cap to cover the front element that is also well-made, and easy to use, even with the lens hood in place. It is worth repeating that the lens is well built, and all the plastic parts have high-quality finishes, there are no sharp or rough edges, and everything that is meant to fit together, does so very well. Pinch-type lens Tokina lens cap. Inside the lens barrel, are 9 optical elements in 8 groups. It would appear that at least one of the elements has coatings that optimise use with digital slr sensors. There is no image stabilization system in this lens. 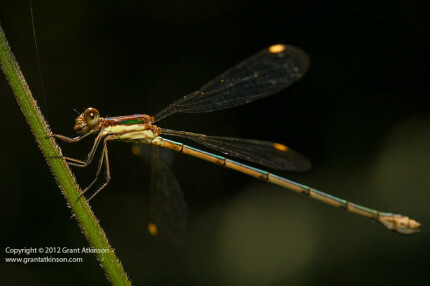 There is some debate amongst macro photography enthusiasts as to the necessity of image stabilization in a macro lens. Obviously, if one is shooting from a tripod, then it is less useful. When handholding though, stabilization would be a plus, but its exclusion must be weighed up against the cost of this lens. The 100mm focal length is also not so long that it makes it too hard to get sharp shots when handholding the lens and using it in a general purpose role. In use the One-Touch clutch for switching from AF to MF is easy enough to use. One merely slides the focus ring back toward the lens mount to disengage AF. If the gears do not align properly, it may be necessary to turn the ring slightly until they do, and the collar will then slide back or forward easily. This system is easy to use, even with cold hands or with gloves on. Autofocus on the Tokina is driven by a motor that is a little noisy, and autofocus is not overly fast. However, it is accurate enough for general-purpose use, and is also effective for handheld macro work. Focusing at close distance though, takes really steady hands, and it can be frustrating. Most macro shooters, myself included, prefer to use manual focus. Switching between the two focus modes is effortless on this lens, and when in manual focus, the wide focus ring turns smoothly and makes accurate manual focus easy. Placing the camera on a tripod, and using live view on the rear screen, combined with manual focus, will produce startlingly sharp results. 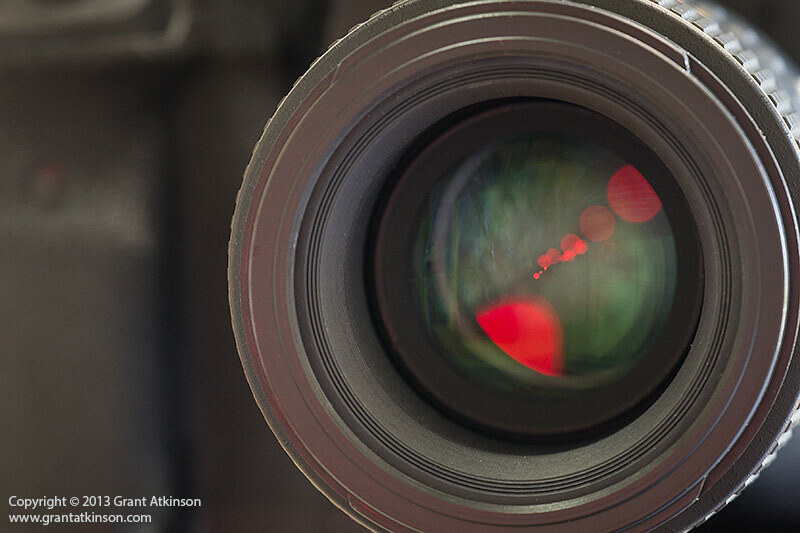 When the lens is focused on subjects that are nearer, the front element extends (but does not rotate). Tokina AT-X 100 Macro with barrel extended. At full extension, the inner barrel projects quite far from the front of the lens (about 55mm) and this should be remembered when approaching insects that might move away. When focused on more distant subjects, the inner lens barrel stays retracted. Be sure to have it retracted for storage and travel. Tokina AT-X 100 with inner barrel retracted. The front lens element is set back almost 30mm inside the inner barrel, and this distance provides good protection for it. I did not put a filter onto this lens, as I did not feel there was any protective need for it. I also felt that having such a large space between the filter and front element might cause some image degradation. The front filter element ring is 55mm in diameter. The front element is set back deep inside the lens barrel. I found that I did not need to use the supplied lens hood when shooting macro subjects. The hood makes the lens bigger and more likely to scare away subjects, and it got in the way of the flash. I did use the hood when shooting the lens in a general-purpose way. The hood can be reverse-mounted on the lens for storage and travel. In that configuration the lens only takes up a small amount of space in a camera bag. Tokina AT-X 100 Macro, Canon 1Dmk3, lens hood removed. I shot the lens on a Canon 5Dmk3, a 1Dmk4, 1Dmk3 and a 7D. At 540g it is light enough that is doesn’t make you tired when handholding. The reasonably light weight is most important when shooting from a tripod, as the Tokina is not so heavy that it cannot be well supported just with the camera body itself mounted to the tripod. This is a definite advantage when compared to longer, heavier macro lenses that require dedicated mounting by means of a lens tripod mount. It balanced very well for handholding on a Canon 7D or 5Dmk3 but is small enough to also work very well on entry-level sized dslr bodies. 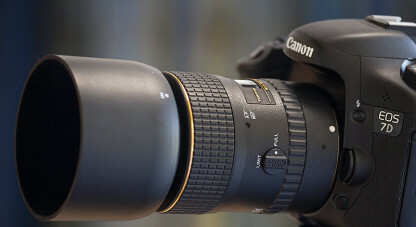 It is worth noting that when used on a Canon dslr with an APS-S sized sensor, like the 7D, Rebel series, T1/2/3/4/5i and the 10/20/30/40/50/60D bodies, that this lens shows a field of view equivalent to approximately 160mm in the viewfinder. 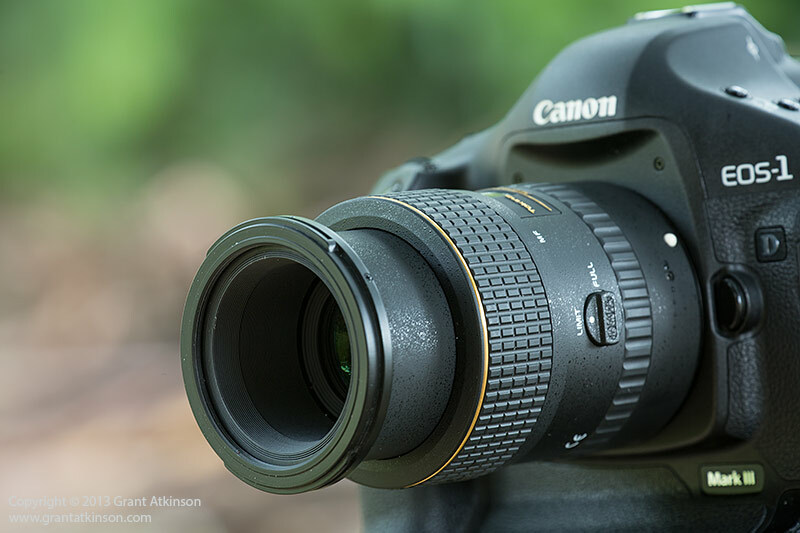 When used on a Canon dslr with a full-frame 35mm sensor, like the EOS 1DX and the EOS 5D series, the field of view is equivalent to 100mm. Tokina AT-X 100 f2.8 macro lens, Canon 5Dmk3. Full-frame sensor. I took two images using the Tokina from the same position with two different camera bodies representing the APS-C sized sensor and the full-frame sensor.. 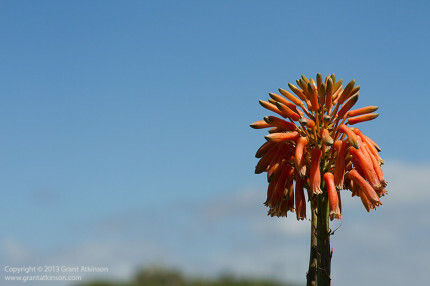 The first image is taken with a 7D and the second with a 5Dmk3. The two images serve to illustrate the different output that the two different sensors in these cameras will produce. The lens is not weather-sealed despite its robust construction. Image quality is very, very good. Fine details are well reproduced, and colours and contrast are pleasingly captured. 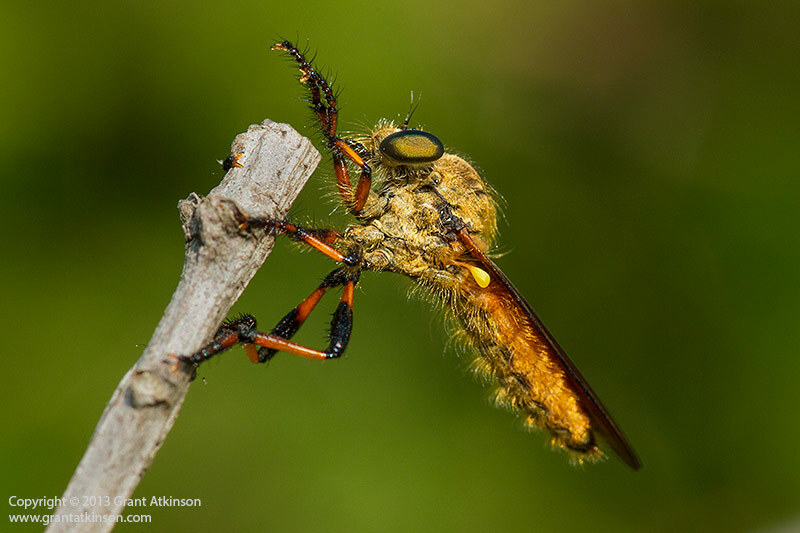 Robber fly. Tokina AT-X 100 macro, Canon 7D, Slik tripod. Shutter speed 1/250sec at f/11, Iso 400, flash. Click on the image for a larger view. Using manual focus, and a Slik tripod, I was able to stop down the lens to f/11 for this image of a smallish (25mm) robber fly at rest, and achieve so much magnification from the lens that the original image is cropped only from 18 to 15 megapixels which I did just cleaning up the composition. Kite spider – Tokina AT-X 100 macro lens, Canon 7D. Shutter speed 1/250sec at f/9, iso 500, fill flash. Handheld. Click on the image for a larger view. 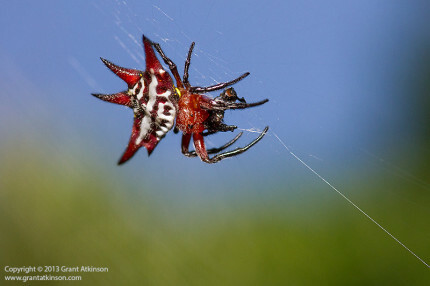 In this kite spider image, which was taken using the lens handheld as the spider was moving with prey, check out the fine details on the spider web right in the corner of the frame. The green and dark areas on the bottom and right of this frame are out-of-focus bushes and leaves that I was shooting in and through. 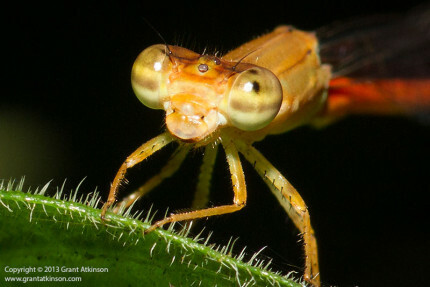 Citril damselfly – Tokina AT-X 100mm macro, Canon 7D. Shutter speed 1/250 sec at f10.0, Iso 400. This is a 100 percent crop of the original file. Click on the image for a larger view. To better examine the lens ability to resolve fine detail, I cropped this image from 18mp to just about 1.2mp, representing a 100 percent view. The Tokina has captured the fibres on the edge of the leaf, as well as the fine detail all around head of the damselfly very well. I did not notice any evidence of vignetting, even on the full-frame sensor of the Canon 5Dmk3. You can verify this for yourself in the 5Dmk3 image which is posted earlier in this review. I purposefully took that image with lots of blue sky around the edges, in order to look for any vignetting. During testing, which is ongoing, I have taken a couple of thousand frames with this lens and I have had it in my camera bag for almost four months now. At the time of writing I do not have enough shooting experience with any of Canon’s 100mm macro lenses to draw direct comparisons, but I am completely happy with the image quality that the Tokina produces for my purposes as a professional nature photographer. There are a variety of options in this lens class and for good reason. The 100mm focal length range is a very good one for macro work, it allows the photographer to be a little distance away from the subject and still get decent magnification. The lenses are also light enough, and of short enough focal length, that they can double as portrait lenses and also as general purpose lenses, which increases their versatility. The Tokina holds it’s own when it comes to the images it makes, as well as its build quality. Cost wise it sits more or less in the middle of the range, with the AT-X 100 Macro Pro D selling at the time of writing for around the R6500 mark locally. Canon make two 100mm macros, one that costs less and the other significantly more than the Tokina, and Sigma, Tamron and Nikon also have offerings in this range. AF is slow and noisy. 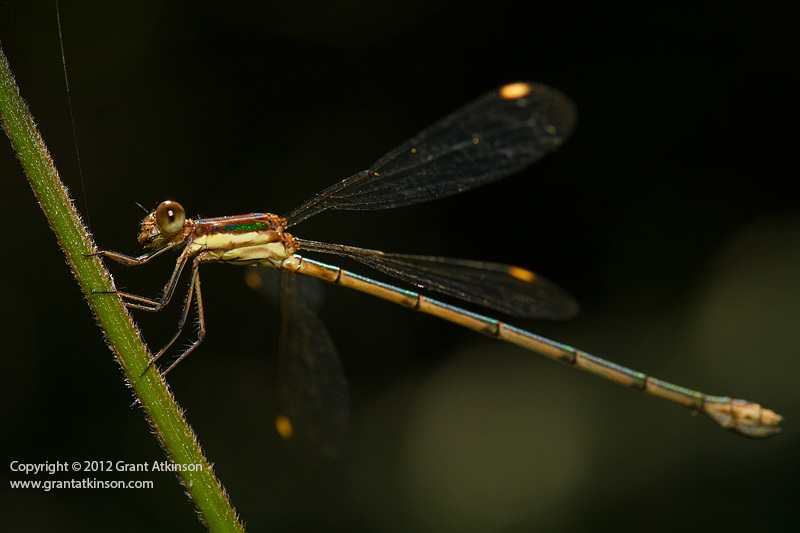 Smoky spreadwing damselfly. Tokina AT-X 100 macro lens, Canon 7D. Shutter speed 1/250sec at f/8.0, Iso 400. Flash, handheld. A lens for the enthusiast, this Tokina provides excellent image quality and robust construction for photographers who may be on a budget. 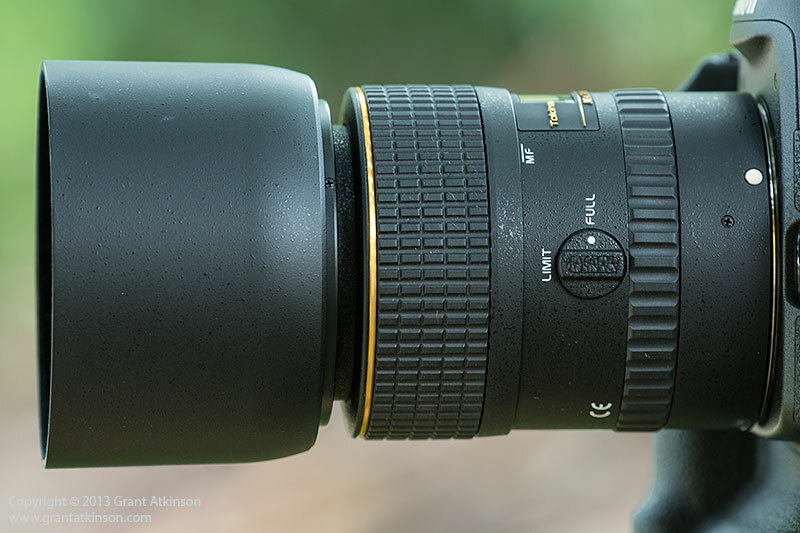 It also makes a worthwhile option for those photographers for whom macro is not their main priority, but who would still like to own a decent macro lens that doesnt hold them back at all. With a decent set of features in its design, the Tokina AT-X Pro Macro 2.8D is rather efficiently built to do a job and it does that for a reasonable price, and should keep on doing it for a long time. 1) There will be a Unsubscribe link at the bottom of that email, just click it and they won’t receive any more emails. 2) They can head over to: https://subscribe.wordpress.com/ enter their email address and they can manage all their subscriptions from there. Thank you for this review. It confirmed what others said about this lens. I just ordered one and await its arrival. Is there a macro ringlite that does fit? Is there one you prefer? Hi Grant, It is an awesome review. I am interested in macro photography. I have used reverse lens/extension tubes. 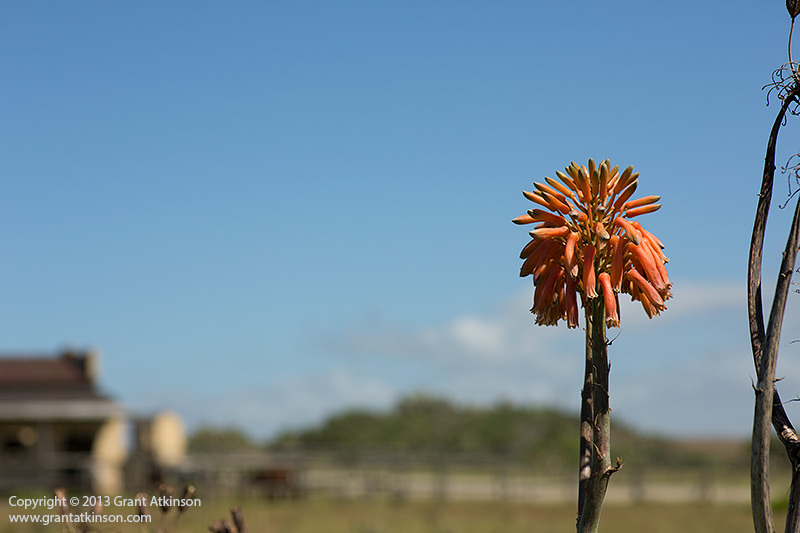 But I can still getting the blurred images in corners even with min aperture while using the same. I wanna buy a good macro lens for my Nikon D610 full frame. Please advice me. Most informative review. It’s been stated a few times by others. 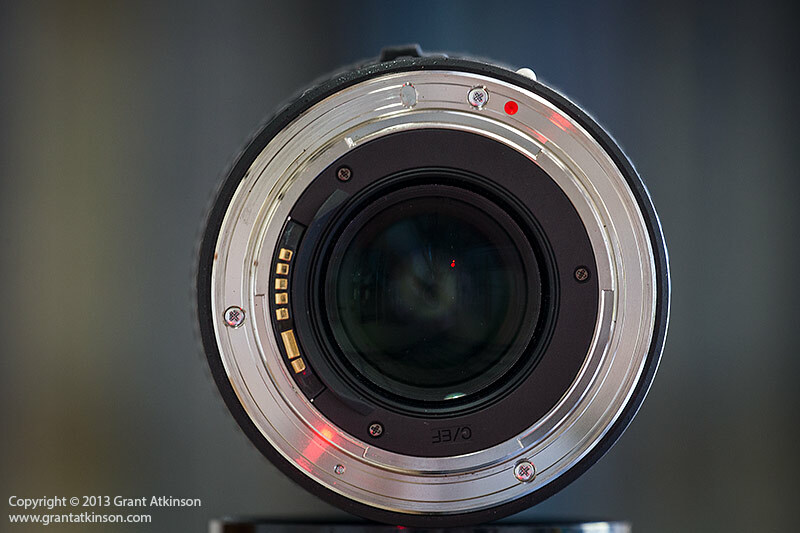 You will never find a critical comment by anyone who has reviewed or purchased this lens. Ratings exceed Canon Nikon and comparable to Zeiss that’s only 1:2. Additionally this lens in underpriced in a comparable market. Been to the cape and area few times, and this 100 macro would be a delight to use in your environment.